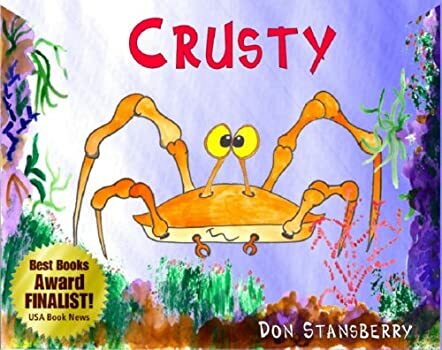 Crusty is an intelligent crab who feels confined by the small minds in the community in which he lives. Feeling scared but brave, he decides to explore his surroundings and ends up in a place where his needs are better met. Crusty befriends a fish who appears frightened and restricted. The fish eats what is available, rather than wander into the Deep Dark where better food may be found. With Crusty's encouragement, the fish leads Crusty to the edge of the Deep Dark, where both of their needs may be met. After awhile, the fish and the crab come upon an unknown water entity, Eep. At first they are alarmed and cautious. But, with time and the trust of one another, they decide to take a chance on the new creature which appears to have imprinted on them as parent figures. The creature grows and grows until, one day, it simply disappears. Crusty then wanders to the edge of the Deep Dark, only to be threatened by huge monsters. Eep reappears just in time to save his friend Crusty. Although Eep must return to thrive, he leaves behind a wonderful gift for his two friends. Children will love this book. The illustrations are colorful and imaginative and the messages, timeless.